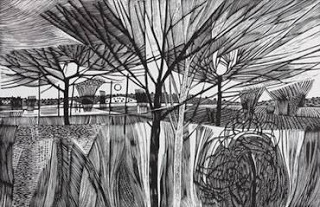 Last month Angela Lemaire had a show of her books, prints and paintings in Edinburgh and now forthcoming in London and Eastbourne are two more shows which will include books from The Old Stile Press. Josie Reed will be known to many who visited her Gallery in Bath where she had several very successful shows of books. Now, as Reed Contemporary Books she has curated a show at Flow in London of artists’ books. Previously we have mentioned Flow because there have been exhibitions of contemporary Designed Bookbindings held there – but this show focuses on the whole book – not just its binding! Josie has selected Jubilate Agno among her fifty beautiful books. 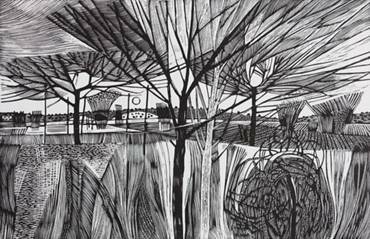 The second show – in Eastbourne – is at the Emma Mason Gallery which concentrates on printmaking. This is an 80th birthday tribute to Garrick Palmer. His book LAND will be among the exhibits which will consist largely of his miraculous wood engravings. Sadly there are no more copies of The Ballad of Reading Gaol which he did with us – though separate prints exist still. We hope some of you may be able to get to these shows – the next Fair which we will be at ourselves is in Oxford at the beginning of November – more details when we know them.